Following his inclusion in Pace’s presentation at Art Basel Hong Kong 2018, Tim Eitel will have his first solo-exhibition in Beijing at Pace’s gallery in the 798 Art District. Featuring a selection of new and recent figurative paintings, the exhibition will highlight Eitel’s continued command of color, technique and form and showcase the artist’s ongoing investigation of interior space, memory and perception. 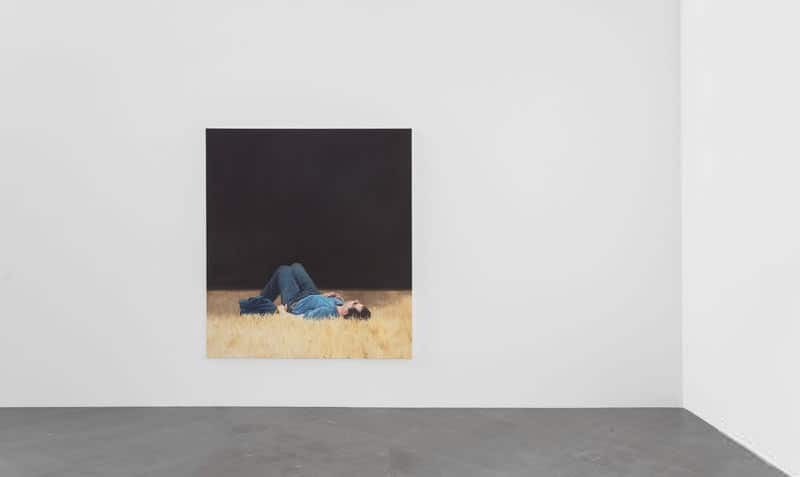 Beijing— Pace Gallery is pleased to announce Sites and Attitudes, the first solo exhibition in Beijing for important German contemporary painter Tim Eitel. In 2008, Eitel’s work was included in Encounters, the inaugural group exhibition of Pace in Beijing. Now, ten years later, the artist returns with a dozen of his latest oil paintings to give a more complete impression of his tranquil, compelling spaces. The exhibition opens on September 29 at Pace in Beijing. On the 28th, the artist will speak at the Central Academy of Fine Arts about the development of his work, his influences, and general ideas about painting. A leading figure of German contemporary painting, Tim Eitel is renowned for his psychological portraits of contemporary society and his depictions of the urban landscape. By stripping away the details of reality, Eitel’s paintings present a near-abstract simplicity that imbues his world with a serene and meditative atmosphere. Those who gaze at these paintings long enough seem to be drawn toward another realm of time and space, into a completely new reality composed of the colors on the canvas, bringing new momentum to realist themes. The figures in Eitel’s paintings often appear alone or maintain a relatively independent presence amidst surrounding crowds. These figures, depicted in profile or from behind, are seemingly engaged in an evasive retreat into some moment of spiritual introspection. For Eitel, solitude in the crowd is more like a stance. By constructing moments of self-dialogue or meditation, people in the city find an oasis for the soul and thus avoid being swept up by the mainstream ideas of the collective unconscious. These themes with powerfully empathetic tones have garnered Eitel much praise both among critics and the general public. A few people appear repeatedly among the dozen works being shown in this exhibition, which strips them from their identity in reality and bestows them with certain symbolic properties. One archetype of an Asian face in a red dress comes from a photograph the artist took during a visit to the China Academy of Art in Hangzhou. Just as critics have long noted, there has always been a unique and quite stable connection between the artist’s painting and photography. On the level of realism, Eitel’s works derive individual experiences with the visible world, often documented in photographs. But in the paintings, there are no concrete traits or indicative details to be found. The pictures, then, are a series of relationships between elements, of juxtapositions between people and spaces, of resistance and coexistence between the individual and the collective. In this completely open narrative space, an overlap emerges between the viewer’s account and that of the artwork itself. It is in this space that an utterly new narrative is born, full of possibility and serendipity. The dimensions of the works reveal another key thread in Eitel’s creative practice. Sites and Attitudes will present paintings as large as three meters, in addition to 20cm works. The former provides a sense of being in the space, while the latter demands a more intimate exchange, an embodiment of the artist’s desire for dialogue. Compared to artists in Modern Art history, who have carried out self-renewal within the artworks themselves, Eitel has never concealed his emphasis on the interactive function of art. As far as he is concerned, the life of the painting does not end when he puts down the brush, but actually has just begun. In the large artwork Blue Sky (Ruins) (2018), the simple scene depicts the Acropolis of Athens. Though Eitel’s paintings generally do not refer to specific sites or locations, this artwork seems to reveal a hidden idea in his heart: to complete the encounter and dialogue taking place in the present, but to reckon with history and stride into the future. In the realm that Eitel constructs for us, both the solitary meditations and the dialogues between souls bring new revelations to the people here in this clamorous world. Tim Eitel (b. 1971, Leonburg, Germany) conveys a deep command of color, technique, and form in his figurative paintings inspired by his observations of contemporary life and art history. He studied at the Hochschule für Grafik und Buchkunst in Leipzig from 1997 to 2001 and was a Meisterschüler (Master Student) of Professor Arno Rink from 2001 through 2003. He has received a number of prestigious awards throughout his career, including the Landesgraduiertenstipendium, Saxonia, Germany (2002) and the Marion Ermer Preis (2003). Cofounder of the collective Galerie LIGA in Berlin, he was one of the leading protagonists of the New Leipzig School before gaining a reputation as one of the most important painters of his generation. He has participated in over fifty group exhibitions and twenty monographic exhibitions worldwide since 2000, including at the Museum zu Allerheiligen, Schaffhausen, Switzerland (2004); Saint Louis Art Museum, Missouri (2005); Kunsthalle Tübingen (2008); Rochester Art Center, Minnesota (2013); Essl Museum, Klosterneuburg, Austria (2013); and Kasteel Wijlre, Netherlands (2018). Eitel‘s work is held in numerous important collections, including the Albertina, Vienna; ARKEN Museum of Modern Art, Ishøj, Denmark; Deutsche Bank Collection, Germany; Hamburger Bahnhof, Museum für Gegenwart, Berlin; Museum Frieder Burda, Baden-Baden; and the Rubell Family Collection, Miami. Eitel has been represented by Pace Gallery since 2006.